Another Japanese commercial for your viewing pleasure. As usual, if you think you know the answer, shoot an email to blueshoe[at]jadij.com. Lately I've been watching some Chinese movies on Netflix. 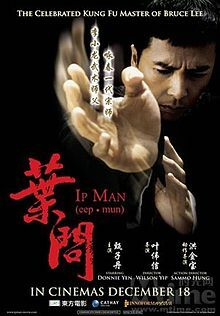 More specifically, Ip Man (1&2), Fearless, The Chinese Connection, and the like. As someone who is sympathetic to Japan, for me it's kind of interesting and sad (though understandable) to see how so many Chinese movies portray Japanese (either as a group or individuals) as bad guys. I'm no apologist for the ruthless things the Japanese army did during World War II, but it's unfortunate that remembrance of those events seems to have become such a staple of Chinese movies. One arch that seems to run through many or most of these films, especially if they are about war or martial arts, is that of the patriotic Chinese underdog beating overwhelming odds to defeat foreign powers who want to oppress and embarrass the Chinese, mostly just because the foreigners are assholes for some reason. This is based to some degree on historical fact, but I find it disheartening how rarely decent foreign characters appear in these movies. Often there are few foreigners in the films at all, but invariably there is always at least one Western guy who is a jerk and some Japanese guy who is a jerk. Sometimes it's a group of Japanese guys or the Japanese army. I was actually surprised that in Fearless there is an honorable Japanese martial artist who actually is a pretty nice guy, as opposed to his counterpart, the spineless Japanese ambassador who only seems to care about money and shaming the Chinese. Anyway, I was just thinking about this recently. It reminds me a lot of how some American movies about the Revolutionary War portray the British as cruel and barbaric, or how the stock accent for evil guys in Scifi movies is usually British. The main difference is that eventually the U.S. and Britain became pretty good allies. Maybe we need to give China another hundred years or two, but somehow I doubt they're going to go sweet on Japan any time soon. Kotowaza (諺) are another element of Japanese (along with puns) that I've taken a liking to, and so I thought I'd share some. If the word is new to you, kotowaza are proverbs or sayings. Like in English or in many languages, I'd imagine, some sayings are used more often than others and some are pretty obscure. So if you do take a fancy to some of these and decide to add them to your repertoire, just be warned that not all of them can be naturally employed in daily conversation. The few that I have down pat I don't use often, myself, but it is pretty fun to be able to understand them when I do hear or see them. In English, this translates literally to something like "It's like I met a merciful person in hell" (though 仏 can also mean "Buddha"). I think this is a pretty good English version of the meaning behind it: "In my hour of true need I found a true friend." Though I'm not exactly sure a "true friend" is what's meant here. What comes to mind for me is the story of the good Samaritan. The guy that had the crap beaten out of him was in his hour of need, and someone merciful came upon him and helped him. I think that situation would probably be an ideal use for this proverb. Wow, has it really been so long since I posted? I guess things got away from me. Last week I accepted a new job, which I want talk about in a little more detail in a post to come. That whole process was taking a lot of energy (and some time), so I suppose that's one reason why I've been dallying here. I have yet to actually read through a full Japanese book since completing Harry Potter two or three years ago, but this one stands a good chance of being devoured. Getting into Game Center CX has made given me quite a few wow, am I an adult child? moments. I mean, not only just liking video games, but liking watching a grown man play them in TV show format? Believe me, I am somewhat self aware. And I had another moment of self awareness upon opening this book and thinking "Thank God, pictures!" Not that it's a picture book, mind you. It has words, I assure you. Words a plenty. But reading through pages and pages and pages of straight text in a foreign language can be a tedious exercise for those who are not yet fully conditioned. I am still such a one. But in conclusion, I have a wonderful girlfriend who not only accepts, but fuels my fascination with video games and with this TV show (so long as I don't become a hikimori). Life is good.